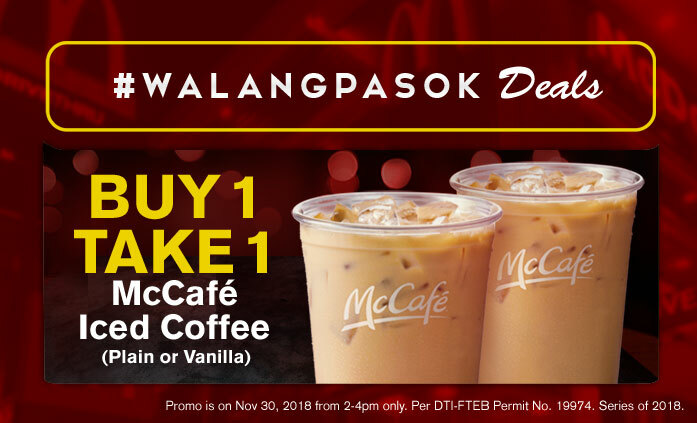 Check out McDo's Walang Pasok Deals Promo happening on November 30, 2018! Get a FREE 16oz McCafé Iced Coffe (Plain or Vanilla) when you purchase (1) 16oz McCafé Iced Coffee (Plain or Vanilla) from any McDonald’s store nationwide on November 30, Friday, from 2PM to 4PM only. November 30, 2018 - Friday, from 2PM to 4PM only.